As we talked about last time, color choice is key to nailing this look. We're going to use polish and rhinestones, in a simple way, but the trick is to choose ones that are just barely a shade different from each other. This will create an almost imperceptible depth to your design. So chic. Pretty, Easy Nails: Gradient or Ombré Glitter or Whatever You Call It? Step 1: Apply a base coat to clean, filed nails. 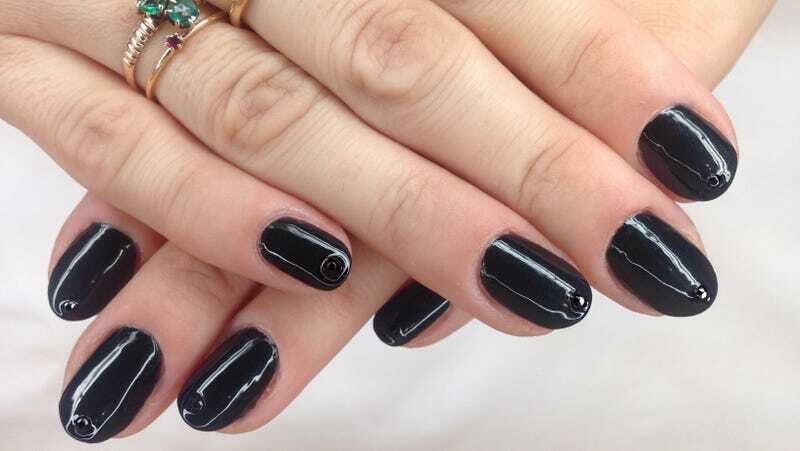 If you plan to take a picture of this step, do NOT trim that annoying little hang nail from your ring finger. Show it off! Now, find some nail rhinestones of any color and pick a nail polish that is not the exact same color but just sliiightly different. I chose black rhinestones and and almost-black shimmery dark green polish. Paint one coat of the polish on all of your nails. Allow it to dry. Step 2: Put about 12 rhinestones in a dish — a few more than the number of fingernails you have in case you drop one or two. Using a skewer, flip them all over so they're right side up (meaning the facets are facing you). When you're ready to apply them to your nails, just lick the blunt end of the skewer and use it to pick up a rhinestone. This works. Step 3: Working one nail at a time, apply a second coat of your color of choice to your nail. Pick up a rhinestone and place it into the damp polish near the end of the nail. If you're worried about this fragile placement, stick it lower on the nail down by the moon to protect it from getting dinged up. Repeat, one at a time, for the rest of your fingers. Step 4: Apply a quality top coat. Behold. In case you were wondering, my first rhinestone popped off on day four (and I have a toddler). Two more followed the next day. I could've easily replaced them by dotting some polish back on and sticking them where they go, but I get bored and always want to redo my polish. If you want more staying power, paint all of your nails with two coats of polish and use nail glue to adhere the stones before applying a top coat. And remember: you can always just get acrylics or gels if you don't like spending almost zero dollars and only thirty minutes at home DIY-ing.